Protecting your company’s data has increasingly grown more complex. 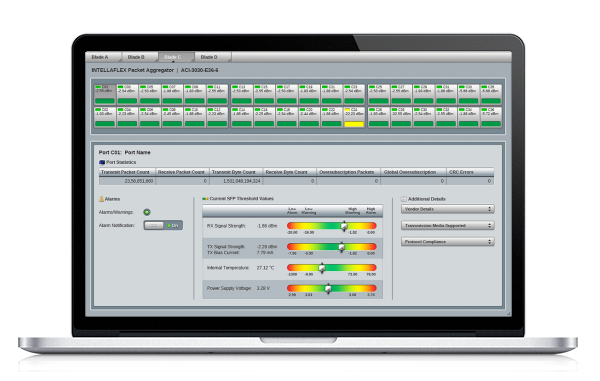 Now more than ever, companies need adaptable and scalable network monitoring solutions. APCON’s family of network monitoring solutions provide visibility, improve security and optimize monitoring tool efficiency for any network environment. APCON’s network monitoring and security solutions for enterprises provide superior packet aggregation technology for visibility at every layer of the network. Network managers can share an inventory of expensive monitoring devices while preventing oversubscription and data loss. Data from multiple sources is aggregated, filtered and directed to performance, application and security tools instantly, while a secure web-based user interface provides a centralized method of controlling network monitoring activity. APCON’s all-in-one network monitoring solution delivers the performance of an enterprise monitoring solution at a price point that works for midsize and remote network locations. The solution combines an integrated data monitoring switch with on-demand traffic capture, onboard storage, packet analyzer and a dedicated application processor with pre-loaded tools. The healthcare industry is responsible for enhancing the patient experience, but with the industry in a vulnerable IT position, network and security teams are faced with complex network challenges. The energy sector has experienced several challenges. From falling oil and gas prices and the rise of electric vehicles to the increased popularity of a solar economy, energy companies have their hands full. But the challenges don’t stop here. IT and security professionals working in the finance industry are fighting network battles on many fronts, while trying to retain customer loyalty and trust. Government agencies are responsible for better serving their constituents, but protecting and distributing citizens’ private information has never been more challenging. Service providers are experiencing a change in network technology. To beat their competitors to market with new services and deliver a superior subscriber experience, service providers need a robust network. IntellaFlex XR is a suite of integrated products that work together seamlessly to provide network visibility and security solutions. Delivering complete traffic visibility in physical, virtual and cloud environments. Ten blades with broad range of advanced features, five chassis provide exceptional scalability and reliability, and intuitive software for configuration and management. It’s smart, integrated, intelligent and flexible – it’s IntellaFex XR. If you can’t see all your network traffic, you can’t protect it. The integrated technologies of the APCON IntellaFlex XR solution help you get visibility of physical, virtual and cloud traffic. Direct traffic to any security or performance tool you want. Efficiency, speed, and security – your network demands it, IntellaFlex XR delivers it. Collect and aggregate traffic from anywhere on your network – physical or virtual environments – enterprise datacenters or remote locations. Powerful multilayer filtering lets you capture exactly the traffic you want – and direct it to any network performance analysis or security tool. IntellaFlex XR chassis are modular with interchangable and hot-swapable components. IT professionals can easily and cost efficiently add capacity with additional blades and software features to meet the demands of growing and more sophisticated networks.Efficiency, speed, and security – your network demands it, IntellaFlex XR delivers it. You would think that managing all the powerful capabilities and multiple configurations of the IntellaFlex XR platforms would be complicated. It isn’t. Intuitive, user-friendly interfaces help manage all blades, and all chassis. Efficiency, speed, and security – your network demands it, IntellaFlex XR delivers it. IntellaFlex XR chassis are designed for networks that demand high availability and system compatibility. Five Models support 1, 2, 4, 8 and 14 blade capacities. Hot-swappable common components. Ten different IntellaFlex XR blades with the broadest range of advanced features including time stamping, packet slicing, multi-stage filtering, data rate conversion protocol stripping and load balancing give security teams and network engineers the power to deliver the right data to the right tools all the time. WebXR | Build, save, view and recall device connections between SPANs/TAPs and monitoring tools with an easy to use GUI. 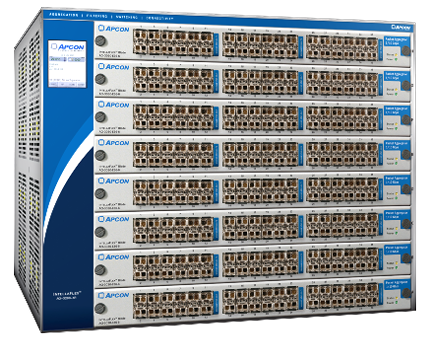 TitanXR and APCON Mobile App | TitanXR provides a single, centralized point of management for a multi-switch network visibility environment. The APCON Mobile App complements TitanXR by providing real time status of the APCON visibility infrastructure remotely.